Who Put the DIE in the Diet Soda? Just when you thought it was safe to enjoy a little carbonated beverage now and then, a study presented at the International Stroke Conference in Los Angeles raises a few questions, as well as the eyebrows of some doctors — and the blood pressure of diet drink company executives. The diet soda study was based on a survey of 2,500 adults in the New York City who were followed for 10 years. The researchers found that those who reported drinking a diet soda every day had a 61 percent increased risk of cardiovascular events compared to those who said they didn't drink soda at all. Researchers came to these conclusions even when accounting for physical activity, smoking, alcohol use and calories consumed. Being a New York City girl myself (transplanted to northeastern Oklahoma), I can't help but wonder if the fast-paced NYC lifestyle had anything to do with it. Some medical doctors and experts in diet and vascular disease are skeptical, too. Now my eyebrows go up a little, too. ABC – TV. Hmm. 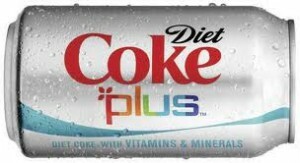 Think any of ABC's ad revenue comes from diet beverage sales? Naaaah. Some nutritional experts believe the artificial sweeteners are worse than sugar, and they may actually make you crave more sweets and fattening foods. Instead of soda pop, drink water (add lemon or a tablespoon of apple cider vinegar and a teaspoon of raw honey for taste, added nutrients and enzymes)—or if you must have a carbonated beverage, try sparkling water or seltzer water (I like to flavor it with Vanilla Creme stevia liquid for a no-sugar, no-calorie “vanilla soda”). To help lower risk of stroke and other cardiovascular disease, most medical experts recommend including a moderate exercise program to improve health. According to the Cooper Institute, walking five times a week for 30 minutes a day at the rate of 3 miles per hour reduces the risk of heart attack and stroke by 58%. The results of a study conducted measuring fitness and risk of dying was published by Dr. Steve Blair of the Institute for Aerobics Research and his colleagues. So, put down the soda, pick up the pace and let's get moving! Laurette’s New Walking Workout – Indoors or Outdoors! Fill your heart and mind with the promises of God while working out with Power Promises Walking Workout! PowerMoves Kids Program – The first program for schools to Combine Character Education AND Fitness. PK-8th grades. For public & private schools, and homeschools.